Trans-Pacific Partnership — Free trade agreement or investors’ Bill of Rights? The TPP will prohibit all signatories from enforcing health and safety standards when profit is at stake. There was a time when borders were wide open for people and much more restricted to capital flowing in or out of countries. Only toward the end of the 20th century did it change when significant controls were enacted to restrict people’s ability to cross borders while money could flow freely. For centuries, nation-states could use their vast powers to protect their fledgling industries from outside competition. A perfect example is Japan’s auto industry, which never would have grown to its dominant world position today had Japan’s borders been wide open to other auto companies. But today, capital is king. The power of large, international corporations far surpasses that of most nation-states’ governments. Armed with so-called free trade agreements, these immensely powerful multi-national corporations are literally blackmailing smaller nations. The examples are staggering. For instance, El Salvador, which is densely populated, has put a moratorium on mining permits. So Vancouver-based mining company Pacific Rim has recently taken El Salvador’s government to task for trying to protect its citizens from the environmental and social degradation that will surely result if Pacific Rim proceeds with its plans for a gold mine. To make matters worse, using the arbitration mechanisms available under the World Trade Organization, Pacific Rim does not even have to give El Salvador its day in court. Instead, the matter will be determined behind closed doors by a WTO bureaucrat. Should El Salvador lose, the damages would literally bankrupt this tiny nation. In another case, Philip Morris is using a bilateral trade agreement between Uruguay and Switzerland (where it recently moved to from the U.S.) to sue the small South American country for increasing the size of health warnings on cigarette packages. These examples, which are the tip of the iceberg, illustrate just how powerful corporations have become. 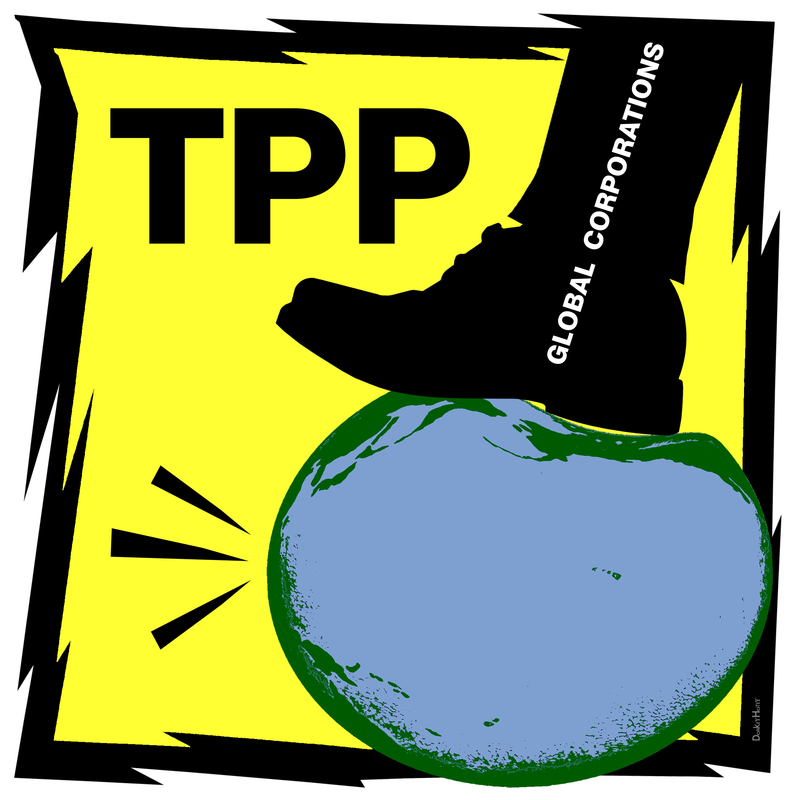 The TPP will allow multinational corporations to undermine democratic decision making locally and internationally. Now lets turn to the Trans-Pacific Partnership (TPP). If this agreement is approved, the governments of all signatories — including Canada — will be prohibited from enforcing all kinds of legislation and safety standards we have come to expect if it means interfering with trade. That includes health and safety regulations on importing foods. Amy Goodman on Democracy Now! recently discussed the downside of the TPP. For instance, in Vietnam’s fast-growing farmed prawn industry, the lagoons are filled with raw sewage and, in turn, massive amounts of antibiotics to keep the prawns alive. So the final product is dubious, to say the least. The TPP, if it’s approved, would do away with our ability to ban or even significantly limit this import. Given all of the above, I’m so pleased that one Vancouver city councillor has decided to put the TPP on the municipal agenda. Green City Councillor Adriane Carr has put a motion on notice for the November 17 Council meeting that the City Of Vancouver oppose the Trans-Pacific Partnership. When I was on City Council, I was proud to succeed in getting an ethical purchasing policy approved. I suspect that this policy would also fall victim to the TPP if it’s approved. So let’s open our borders to people and think twice before we give corporations carte blanche to move money and products across our borders. This entry was posted in Canadian politics, City Hall, equality, food security, social justice, Trans-Pacific Partnership, Vancouver and tagged TPP, Trans-Pacific Partnership. Bookmark the permalink. 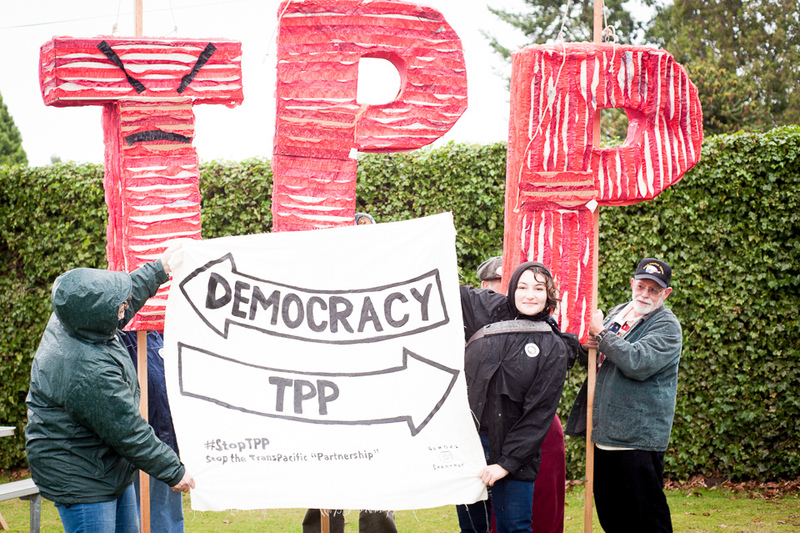 One Response to Trans-Pacific Partnership — Free trade agreement or investors’ Bill of Rights? Tim, you are so right about this. I am extremely troubled that there can be a climate conference in Paris to discuss what “we” all should do about climate change while the same people, in many cases, look to move the world further into a global corporatocracy which will only exacerbate devastation of the planet. I just don’t understand and it makes me very distrustful of the motives of both.